The concept of normal is so familiar that it can be hard to imagine contemporary life without it. Yet the term entered everyday speech only in the mid-twentieth century. Before that, it was solely a scientific term used primarily in medicine to refer to a general state of health and the orderly function of organs. But beginning in the middle of the twentieth century, normal broke out of scientific usage, becoming less precise and coming to mean a balanced condition to be maintained and an ideal to be achieved. 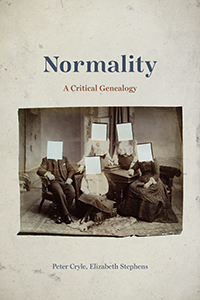 In Normality, Peter Cryle and Elizabeth Stephens offer an intellectual and cultural history of what it means to be normal. They explore the history of how communities settle on any one definition of the norm, along the way analyzing a fascinating series of case studies in fields as remote as anatomy, statistics, criminal anthropology, sociology, and eugenics. Cryle and Stephens argue that since the idea of normality is so central to contemporary disability, gender, race, and sexuality studies, scholars in these fields must first have a better understanding of the context for normality. This pioneering book moves beyond binaries to explore for the first time what it does—and doesn’t—mean to be normal.